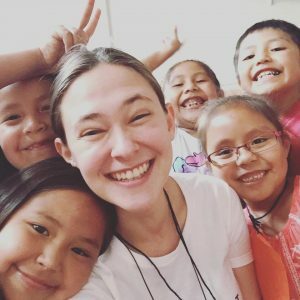 21-year-old violinist Ariel Horowitz founded the Heartbeat Project, which helps fulfill a need for music education in the Navajo (Diné) Nation. Horowitz, who received Alumni Leadership Grant funding in 2017, appeared on NPR’s From the Top in 2012, at the age of 16. Ariel graduated from the Juilliard School in May, and is a current student of Ani Kavafian at the Yale School of Music as a recipient of the Julia Havemeyer Scholarship and Fellowship. Founded in 2016, The Heartbeat Project offers a math-infused introduction to classical music presented in a respectful dialogue with traditional Navajo music. Through a 10-day program for K-12 Navajo (Diné) students and adult learners, The Heartbeat Project will explore Diné and classical repertoire. A team of eight teaching artists, along with music-math consultants and counselors, will conduct workshops and concerts at Navajo Technical Institute. The From the Top Alumni Leadership Grant will support transportation needs for students and teaching artists. The From the Top Alumni Leadership Grant is funded by the Howard and Geraldine Polinger Family Foundation, with additional support from the Karma for Cara Foundation.